From an intimate gathering to an elaborate party, event planning can be tedious and overwhelming. Follow these 7 strategies and you’re on your way to a perfect party your guests will never forget! Budget is crucial. Defining your budget will help you lay out the framework for the rest of your party. If your budget is low, maybe a public park or a house party is best. If you’ve got funds to spare, maybe an upscale venue will better fit your needs. Start with this first step, and you’re on your way to a great event! This next step seems a little obvious, but it is imperative for party planners to plan ahead! If you are aiming for a formal party, you’ll probably want to have an evening event at an elegant venue. If you are going for a casual feel, an afternoon party at a park or mellow venue may suit you best. No matter what type of party you are having, plan in advance! Your pocketbook and your guests will thank you. Though selecting a theme for your event isn’t necessary, it can certainly make it more fun, and help make decisions about invitations, décor, music and even food a bit easier! All of us here at Casino Knights, Inc. think you should make it Casino, of course! Check out our favorite Casino-inspired themes. In this digital age, there are so many ways to send invitations, including text messages, email invites, and the classic envelope-and-paper invitations. Head on over to our article on our top party invitation tools for inspiration. Decor can help play up your theme and can be as simple or as extravagant as you desire and your budget allows. The key is to brainstorm in advance so you have plenty of time to collect everything you need! 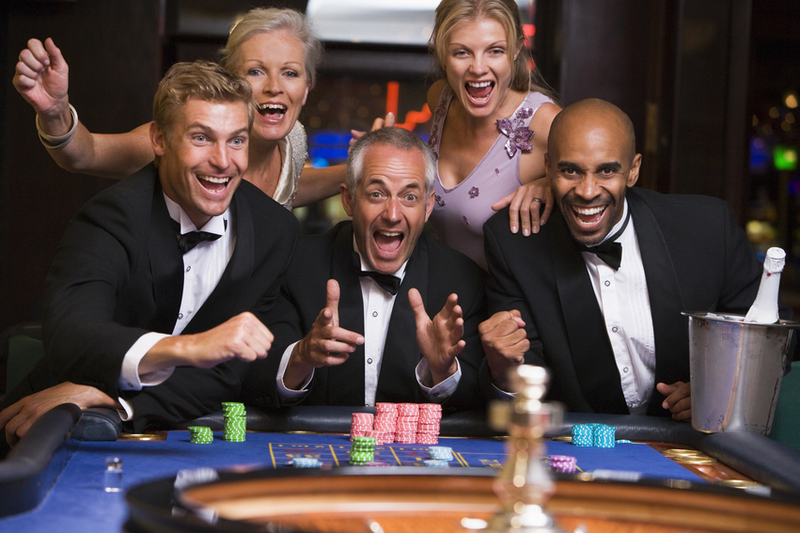 Sometimes food, drinks, and guests are all the entertainment a party needs, but your party will certainly be an event to remember if you host fun group activities (especially Casino games)! If you decide to go Casino, give Casino Knights a call immediately! The earlier you coordinate with us, the better we are able to serve you and get you all of the games and staff you need. Another thing to consider when hosting a Casino party is the flow of traffic. It’s important to arrange Casino games in the center of the party and have additional seating or standing room on the outside of your event facility. We know just how to arrange our game tables and dealers so your guests are connecting and feeding off the fun, positive energy all party long! If you’ve selected a theme for your event, it’s always a good idea to coordinate food and drinks with your theme. Food and drink should also correlate to the overall feel of your event; if you’re going for casual, simple finger foods are best. Going for formal? A heated buffet or hors d’oeuvres are perfect. If you are getting a caterer, again, it’s imperative to plan ahead! Got party questions? Give Casino Knights a call and our highly-experienced staff will be happy to help you out.